Cold brewing is a very time-consuming process; it may take several hours of extraction time. As the name suggests, the method requires cold water. Cold water differs from hot water in terms of what elements and in what proportions it extracts from the grounds. Cold brewing extracts around 90% of the most volatile flavor elements and caffeine, but only around 15% of the oils and acids. No wonder, the taste of the beverage changes dramatically. For most people, this is a delicious, “super-flavor” coffee. The concentration of flavor elements is up to 200% in comparison with a traditional coffee, while the acidity level and bitterness are extremely low. If you enjoy the “strong” coffee, with high acidity level and impressive bitterness, then the cold brew is probably not for you. However, in fact, cold brew is very balanced, so for most people this beverage tastes great. So, the best strategy is to try it at least once or twice to see whether it is for you. Also, there are several cold brewing methods, each producing a different result. The taste varies much from one variety of coffee to another. The proportions of water and grounds are the same (4:1). Experts recommend a medium coarse grind. What’s to love about the device? Firstly, it provides you with a variety of options in terms of the wait time (3-12 hours), and the brew itself (stronger, milder). The materials used for the coffee maker include Borosilicate glass, stainless steel, and food-safe silicone. One of the distinctive features of the model is the so-called Rainmaker. Due to it, the water is more evenly distributed over the grounds, which results in more even extraction. One more advantage is a special switch, which is designed to let you stop or begin draining easier. Quite a few cold brew enthusiasts claim the time the liquid spends in the refrigerator worsens its quality as the beverage becomes oxidized. This does not happen if the Japanese method is used. Also, it gives you an advantage in terms of the wait time. Japanese method involves two basic steps: coffee is brewed with hot water, and then about half of the water is replaced with ice. So, you get a rich in flavors cold drink without the need to wait for several hours. You can vary the strength according to your taste. Japanese cold brew devices are rather easy to use: you just put the grounds into filter at the top and pour the hot water. The device is made of natural materials (wood and glass), without metal or plastic parts. It can be used as a portable coffee maker. One more benefit is that you can put the beverage in the refrigerator and reheat it without losing much of the flavor. In the course of time, the wood collar grows dirty. In this case, you just remove and clean it. 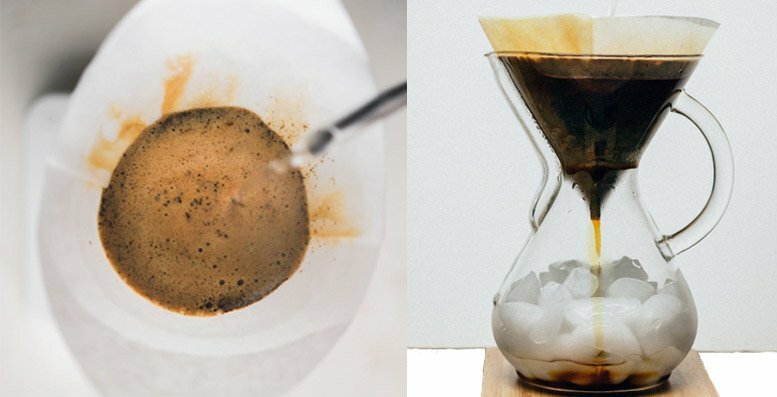 In the Chemex special unbleached filter squares are used, which are sold separately.